The trend that is Fiber Optic Internet connection is as fast as it is advertised. People ranging from home owners to entrepreneurs are now shifting to fiber optics to help and answer their daily connectivity needs. ISP’s all around the globe are strongly offering this service, and the number of users has increased exponentially the past few years. Fiber was first developed in the late 70’s, which was deployed in the late 80’s and has not aged out yet in the present. We really don’t know how long fiber optic will last but it has proven to last for decades up until today. It just tells you how reliable fiber optics are, developed and used for decades. Now, fiber optics are used in different kinds of fields. From computer or IT infrastructures, fiber optics are expanding which led them to be also used for medicine, broadcasting and military, to name a few. Nowadays, a lot of companies are starting to realize and understand the importance of being fiber optic-powered. Because of that, they are quickly upgrading to fiber optic communications. While on the other hand, there are still lots of people who don’t realize the positive effects and advantages of fiber optics with their long-term objectives and the mission of their company. It should require more research and reading about fiber optics for businessmen to fully understand it, and the best way to start is to read about the FOA, or Fiber Optic Association which is the standard for training and fiber optic course for certifying fiber optic technicians. How are fiber optic transmissions sent? Fiber optic signals are sent by transmitting information from one place to another in form of light pulses going through a transparent fiber strand of either glass or plastic. From piping signals for telephone, fiber optic wires ensure every user that the signal is not distorted or diminished. Lastly, the signal is then received and converted into an electrical signal. How has fiber changed telecommunications today? Many years in and fiber optics are now used to its full potential for telecommunication services. Considering fiber optic technology was first created more than 43 years ago, the progress is kind of a “slowly but surely” process. 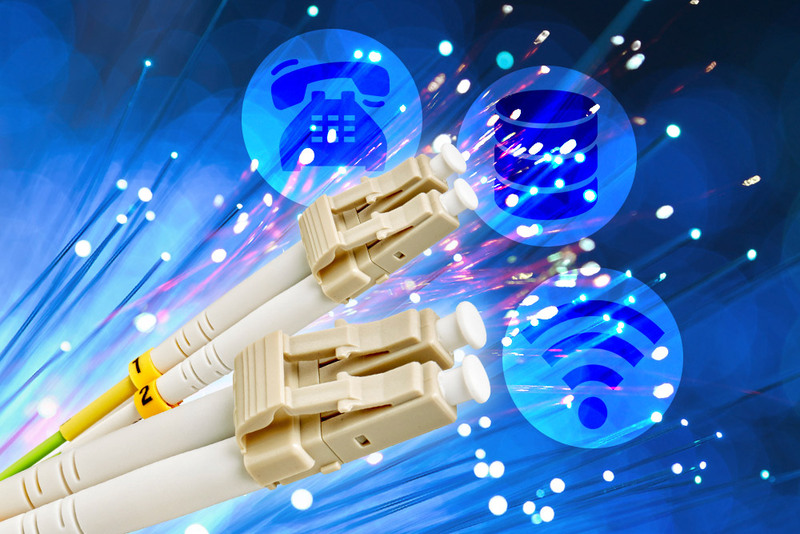 The current landscape of the telecommunications industry today has evolved so much, and it is all because of fiber optics, currently the most widely used method of telecommunications. Fiber optics has drastically changed not only the telecommunications industry, but also with other industries when everyone was solely dependent on using copper-based wires. Now, almost every company has shifted from using copper-based wires to fiber optic cables. For example, majority of the households or companies that have telephones are now using fiber optic cables. Fiber optics delivers more, be it connection or data. It’s more than ten times ahead of copper-based wires. Fiber optic technology provides a lot of advantages over copper wire-based communications that is very suitable in today’s high-tech world. It has an extremely high bandwidth that no other cable-based data transmission medium is close to what it offers. Fiber optic cables are great for longer distances because they provide low power loss. Lower attenuation and less interference then goes after them. Add in fiber optic cables are lightweight as they are made of glass or plastic and thinner than any other kind of cable. And on top of all that, the most important thing for everyone is fiber optics offer faster speeds. What to consider when you are fiber optic connected? Protection is always a priority, especially if it involves wiring. Commercially produced optical fibers have surface flaws. They are small micro-cracks that reduce the longevity of the material used, cutting down their overall lifespan. Manufacturers of the cables figured out a way to prevent these and to strengthen the cable’s protection, by coating a protective material specifically designed to make the fibers more durable in the long run and proof testing the cables to overcome these flaws. But most importantly, invest in fiber optic cables that has high-quality protective materials that will guarantee the cables to last long. Made partly of glass, fiber optic cables are more fragile than copper. During the installation process of fiber optic cables, 3 techniques are commonly employed. These are pulling, pushing and blowing. Of the three mentioned, only pulling causes stress to the cables creating undesirable stretches, also called tensile stress. This can cut down the cables’ lifespan right from the get-go of installation. Opposite of that, is pushing. This technique does not cause harm to the cables and is much safer during installation than pulling. All of that of course is up to the accredited fiber optic technician, ensuring the cables are not overstrained when installing them. The environment always has a say in everything, even in the world of fiber optic network connection. Reliable and resistant, a range of environmental factors can shorten the lifespan of fiber optic cables. These include too much heat/elevated temperatures, presence of water, animals, vandalism and weather. When temperatures elevate or get too high, crack growth accelerates reducing the life of the cables. The presence of water is by far the most concerning. Constant exposure to water leads to stress corrosion, which is the growth of crack formation under tensile stress. Here in the Philippines, we have the Nexus-net company to assist and provide you the latest innovations to help your business grow. For those companies who want to update or improve their internet connection, Nexus-net can provide you the best installation and maintenance until the completion of the project. They have a pool of certified fiber optic technicians (CFOT) which are FOA approved that are considered experts in the field and equipped with highly amendable skills to give you the best service to cover your expectations.